The University of Toledo houses the only disability studies program in the country with faculty members solely devoted to disability studies, one of whom was recently recognized for her work. 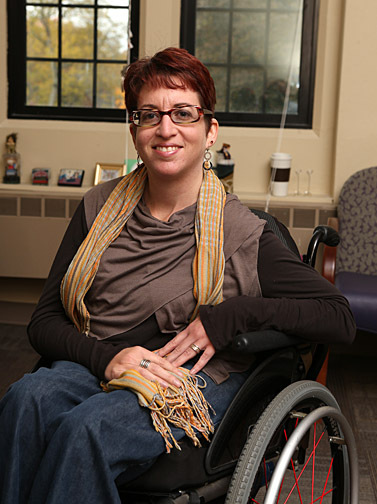 Dr. Liat Ben-Moshe, assistant professor of disability studies, was granted the Western Social Science Association’s 2016 New Scholar Award. Ben-Moshe specializes in applying disability studies to imprisonment and incarcerated individuals. She recently edited Disability Incarcerated: Imprisonment and Disability in the United States and Canada, a book examining the incarceration and segregation of people with disabilities, which she cites as one of the reasons she received recognition. Through her work, Ben-Moshe hopes to bridge the gap between the two fields. Since the book was published, the editors have been invited to various universities and grassroots organizations nationwide to speak, which is where Ben-Moshe encourages collaboration. The Western Social Science Association works to advance scholarship, teaching, service and professional exchange across the social science disciplines. Its mission is to foster professional study and promote teaching of social science. Ben-Moshe will receive her award later this month at the president’s luncheon at the association’s annual meeting in Reno, Nevada, where she will present her research. For more information, contact Ben-Moshe at liat.benmoshe@utoledo.edu or visit wssaweb.com. This entry was posted on Wednesday, April 13th, 2016 at 3:49 am and is filed under Languages, Literature and Social Sciences, News, Research, UToday .